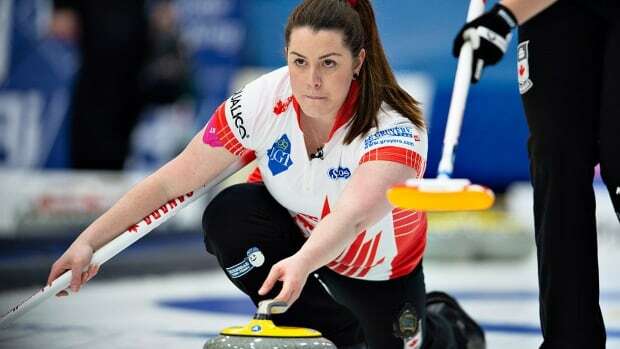 Scotland's Sophie Jackson scored one point in an extra 11th end in a 6-5 win over Canada on Tuesday at the world women's curling championship in Silkeborg, Denmark. The loss dropped Chelsea Carey’s Calgary-based rink into a tie for seventh with Japan at 3-3. Carey appeared to be in control until Scotland tied the game with a deuce in the eighth end and took a 5-4 lead with a steal of one in the ninth. Canada forced the extra end with one in the 10th, but missed a chance to win when Carey’s last shot was heavy. "We're just not getting rocks where we need them, when we need them," said coach Dan Carey. "I'm not sure what happened; we just didn't make as many shots in the last half of the game as we needed to. Really, it came down to that short run that we missed, and we seemed to struggle from there on." That "short run" was a shot Chelsea Carey attempted in the seventh end — a runback takeout that would have scored four for the Canadians and given them a 7-2 lead — didn't curl enough Canada had to settle for a single and a 4-2 lead. Jackson immediately tied the game with an eighth-end deuce, and stole one in the ninth to take her first lead. And in the 11th, Jackson — who’d missed three straight games with a back injury — settled her nerves to make the shot for the win, which improved Scotland’s record to 4-2, good for fifth place. The top six teams after the round-robin qualify for the playoffs. "We'll talk about it, hopefully find some good from it, get something to eat, and then go out to play," said Dan Carey. "Now, we just have to go out and play. Make some shots and see what happens. Our backs are to the wall pretty much; we just have to make some shots and win some games. And then it'll feel a lot different." Elsewhere, Sweden and South Korea joined idle China and Russia in a four-way tie for first at 5-1. Sweden downed winless Finland 10-2, while the Koreans thumped Japan 11-4. Latvia picked up its first win of the tournament with an 11-8 win over host Denmark. Latvia improved to 1-5, while the Danes joined Finland at 0-6. Canada faced the United States in Tuesday's late draw.